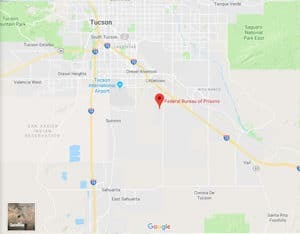 Part of FCC Tucson facilities including:USP Tucson and an adjacent minimum security satellite prison camp, and FCI Tucson with a detention center. Facilities: FCI Tucson with a Detention Center. Location: FCI Tucson is located in southern Arizona, 10 miles southeast of Tucson, near I-10 and Wilmot Road. Background: FCI Tucson was opened in 1982. It is part of the Tucson Federal Correctional Complex (FCC). An administrative unit houses male and female inmates. Notable inmates include Charles Keating (served 5 years for bankruptcy and wire fraud) and Abu Khalid Abdul-Latif (serving an 18-year sentence for conspiracy to murder U.S. officers). Psychology Services: FCI Tucson Psychology Services Department provides screening, assessment, and treatment of mental health conditions, individual and group counseling, psycho-educational classes, self-help and supportive services, and referral to Health Services for medical treatment of a mental illness. Typical groups include anger management and stress management. Notices of upcoming treatment offerings are posted in inmate housing units.